The Reds undoubtedly have one of the best farm systems of any organization in baseball, but due to promotions (Mike Leake), injuries (Kyle Lotzkar), and trades (Zach Stewart) impact righthanded pitching is in short supply. Fortunately, the Reds have focused on international free agency as well as the amateur draft in order to rebuild the farm system, a decision which has resulted in a wealth of prospects, including Daniel Corcino. 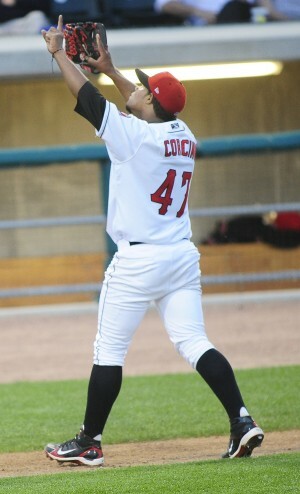 The Reds signed Corcino as an international free agent out of the Dominican Republic in 2008 and he made his debut in American professional baseball with 29 solid rookie league innings in 2009. In 2010, Corcino split time between rookie Pioneer League Billings Mustangs and low-A Dayton Dragons. Corcino spent time with Billings in 2009, so 2010 was a return engagement for him. For the Mustangs, Corcino tossed 39.2 innings in which he posted a 3.40 ERA, 1.39 WHIP, and a 31/17 K/BB ratio. That ratio is good for a 3.86 BB/9 and 7.03 K/9. He also managed to induce a significant amount of groundballs to the tune of 1.37 GB/FB ratio. His peripheral stats support his overall level of performance, as evidenced by a .303 BABIP, 72.5% strand rate, and 3.81 FIP. For Dayton, Corcino logged 31.1 innings of 4.31 ERA, 1.47 WHIP, and a 39/15 K/BB ratio. This time, his peripheral stats indicate he was better than his overall level of performance. His 3.49 FIP was almost a run lower than his ERA. He also posted a .319 BABIP and a 69.3% strand rate, so he was perhaps a skosh unlucky. Regardless, he once again piled up the groundballs, this time at an even more impressive 1.72 GB/FB rate. While the strikeout and walk ratios are solid, they aren't eye-popping. At the same time, Corcino does get a bump in value for age-vs.-level, as he spent almost the entire 2010 season pitching at the age of 19. So, there weren't many players who were younger than Corcino, including the opposing hitters that he faced. The fact that a high proportion of hitters he faced had more experience and development time under their belts than Corcino makes his performance more impressive. Corcino features a fastball that sits in the 91-93 range and touches 96 at its peak. He also has a sharp slider that sits at 75-78 mph and has legitimate plus potential. He also mixes in a changeup that remains a work in progress. If he is going to stick in the rotation as he climbs the ladder, then he'll need to refine his secondary offerings. Right now, he leans heavily on his fastball/slider combo for his success, but he'll need a third pitch to avoid a switch to the bullpen down the road. As for the pitching mechanics, he grades out pretty well. To start, he peers in over the top of his glove, which he holds up high in front of his face, to get his sign from the catcher. His first move is a step towards first base with his stride foot, which unweights his right foot, enabling him to rotate it down and onto the rubber. While rotating his lower body to drop down onto the rubber, he drops his hand position from in front of his face down to almost belt level. After rotating his body position on the rubber, Corcino brings his left leg up into his leg kick and correspondingly raises his hands back up in front of his chest. His leg kick is strong, as it incorporates some hip rotation and brings his knee up past parallel. The hip rotation builds up tension and rotational energy, while the high knee position generates significant potential energy. At the apex of his windup, Corcino is in a strong position and has built up significant energy to impart on the baseball, which is the primary goal of the first half of the windup. Next, to translate that stored energy to the baseball, Corcino drives to the plate with a strong push off the rubber. His arm action is clean and loose, as his elbow maintains good position in relation to his shoulder and his arm is up in proper throwing position when his plant foot lands. He throws from a high three-quarter arm slot and generates good arm speed without maximum effort. Additionally, his mechanics are such that he can effectively throw with his entire body. By incorporating significant leg drive and hip rotation, Corcino should be able to reduce the stress on his arm, which gives him a slightly lower level of injury risk. Of course, clean mechanics are no guarantee of good health, but they should increase the chances of a pitcher staying healthy. One potential problem of Corcino's mechanics is his inconsistent stride length, as his plant foot seems to be inconsistent in its landing spot. At times, he has such a long stride that he throws against a stiff plant leg, never getting out over the top of his plant foot. Instead of finishing with his momentum heading towards homeplate, he has to spin off towards first base as his checked momentum works around his plant leg. Other times, he uses a shorter stride and does get out over the top of his plant foot which results in a more direct-to-the-plate finishing position. The inconsistency in the landing of his plant foot could lead to inconsistency in command. Corcino's shorter stature may work against him, as it will more difficult to throw on a downward plane. To me, however, the potentially bigger downside of being short in stature is that you release the ball farther away from the plate than tall pitchers. Taller pitchers have longer limbs, which mean a longer stride to the plate and longer arms, both of which place taller pitchers closer to the plate when they release the pitch. The closer to the plate you are when you release the pitch, the less distance the ball has to travel and the quicker the pitch gets on the hitters. Due largely to his physical stature, nationality, and repertoire, people have taken to comparing Corcino to Johnny Cueto, but at similar points in their development Corcino is a clear tick behind Cueto in both command and stuff. Corcino has nice upside and a decent amount of polish, but as a 20-year old prospect he still has a long way to go in his development. Corcino is a solid prospect who, almost by default, has become one of the top righthanded pitching prospects in the system. He has a nice blend of polish, stuff, and mechanics that could see him develop into an impact pitcher, but there are a lot of wrong turns on the development path to the majors and I'll need to see more against more advanced competition before I'm sold. For now, he has flashed enough upside to land at #23 on the list.